Houston is #1 in growth of college grads with a 50% increase since 2000, at least according to the graph in the NYT story here, although you wouldn't know it from the article, which doesn't even mention us. More here, which also points out how much Dallas is lagging in Texas. The WSJ on the backlash against toll roads in Texas, especially around DFW. I'm a big proponent of toll roads, as they remind people what it really costs to live far out and commute in (as opposed to the illusion of free highways), but I'd also like to see the gas tax indexed for inflation. Texas is falling dangerously behind in infrastructure investment. A map of the longest commute times in Houston by zip code. Houston #1, by far, in new office construction, more than twice as much as #2, NYC. Houston and Austin ranked first and second, respectively, topping San Francisco. In similar examples, Charlotte, N.C., ranked higher than Seattle and Boston, while Nashville topped Manhattan. Dallas/Fort Worth ranked No. 5. Good personal essay in the Houston Press on the Houston vs. San Francisco theme. GHP's October report has some good notes on our economy, including noting that we've hit a half-trillion dollars in metro area GDP, #4 in the nation, and some new census data. A review of Joel Kotkin's new book on the new class conflict. I'd love to hear opinions on this conflict and the "clerisy" in the comments. “Soulless” and “boring” are to some extent judgmental code words for “stuff I don’t like.” Sophisticated urbanites tend to look down on much of suburban life. But I suspect many suburbanites find downtown obsessions – contemporary art, say, or elaborate ways of preparing coffee – equally tedious. Why isn’t their thumbs-down verdict on urban pretentiousness just as valid? Those of us who love urban areas’ walkability, variety and novelty often have a tendency to universalise – not to say sacralise – our values and tastes. But in an ever more diverse world, different people are going to have different ideas about the good life. We need to be more tolerant of those who make different choices. (In Arlington you can’t even argue that the car culture is killing the environment, since as Adler notes they’ve focused much more on transit and density than your average place). Some people like stability, predictability, rootedness and a lot of what suburbs have to offer. There’s nothing wrong with that. We frequently fail to recognise that our own personal preferences are in most cases just that. And too often in urbanist discussions, that means white hipster preferences. Finally, to end on a humorous note, xkcd does a little amusing NASA Houston humor. Don't miss the mouse-over pop-up text (only at the link). It came out today as the lead op-ed in the Sunday edition, paired nicely with David Brooks' column on Houston vs. San Francisco. Unfortunately the online edition does not include the COLA incomes graph that's in the print version, so I will include it below along with the full text for posterity (Chronicle links are not known for longevity). I'm not thrilled with the headline they chose - since our topic is Opportunity Urbanism, not economic diversity - but the subhead is good. You can also check out Nancy Sarnoff's column about Joel's luncheon speech here and the full report here. Enjoy - looking forward to your thoughts in the comments. Although contrary to much of the conventional wisdom about cities and regions, this is not a break with traditional urbanism, but instead a reinforcement of old traditions. Long ago, Aristotle reminded us that the city was a place where people came to live, and they remained there in order to live better. "A city comes into being for the sake of life, but exists for the sake of living well." In the end, opportunity urbanism rests on the notion that cities serve, first and foremost, as engines to create better lives for the vast majority of its residents. The Houston metropolitan area reflects the idea of opportunity urbanism more closely than any major metropolitan area. Across a broad spectrum - income growth, new jobs, housing starts, population growth and migration - no other major metropolitan region in the country has performed as well over the past decade. This was among the first major metropolitan regions to replace the jobs lost in the recession and has experienced by far the largest percentage job growth since, with Dallas-Fort Worth second. In many ways, opportunity urbanism contrasts with the prevailing urban planning paradigm - variously called new urbanism or smart growth - which seeks to replicate the dense, highly concentrated monocentric city of the past. This approach posits the notion that policies of forced density, through regulatory mandates and often subsidies, are critical to attracting both young, educated people and the global business elite. This approach describes the successful city, in the words of former New York Mayor Michael Bloomberg, as "a luxury product." This notion of the "luxury city" worked, at least for some, in well-appointed older cities such as New York, San Francisco and Boston. Unlike most American cities, these boast long-established dense cores and transit-oriented areas where residents are employed. They possess great amenities tied to their pasts, from world-class art museums and universities, to charming historic districts, parks and public structures. But this model of urbanism does not fit the profile of most American metropolitan regions, which tend to be far more recent in their development, more dispersed and overwhelmingly dependent on cars in terms of commuting. Indeed, most of the fastest-growing regions in this country - Houston, Dallas-Fort Worth, Oklahoma City, Raleigh and Nashville - function in a highly multipolar model that contrasts sharply with that of cities like New York, Boston or Chicago. The luxury paradigm has worked for some in some cities, but has failed, critically, in providing ample opportunities for the middle and working classes, much less the poor. Indeed, many of the cities most closely identified with luxury urbanism tend to suffer the most extreme disparities of both class and race. If Manhattan were a country, it would rank sixth-highest in income inequality in the world out of more than 130 countries for which the World Bank reports data. New York's wealthiest 1 percent earn one-third of the entire municipality's personal income - almost twice the proportion for the rest of the country. Indeed, increasingly, New York, as well as San Francisco, London, Paris and other cities where the cost of living has skyrocketed, are no longer places of opportunity for those who lack financial resources or the most elite educations. Instead, they thrive largely by attracting people who are already successful or are living on inherited largesse. They are becoming, as journalist Simon Kuper puts it, "the vast gated communities where the 1 percent reproduces itself." Not surprisingly, the middle class is shrinking rapidly in most luxury cities. A recent analysis of 2010 Census data by the Brookings Institution found that the percentage of middle incomes in metro regions such as New York, Los Angeles and Chicago has been in a precipitous decline for the last 30 years, due in part to high housing and business costs. A more recent 2014 Brookings study found that these generally high-cost luxury cities - with the exception of Atlanta-tend to suffer the most pronounced inequality: San Francisco, Miami, Boston, Washington DC, New York, Chicago and Los Angeles. In recent years, income inequality has risen most rapidly in the very mecca of luxury progressivism, San Francisco, where the wages of the poorest 20 percent of all households have actually declined amid the dot com billions. Like other large cities, Houston also suffers a high level of inequality, but its lower costs have helped its middle and working class populations to enjoy a higher standard of living than their luxury city counterparts. The promise of the opportunity urbanism model also can be demonstrated by smaller income disparities between racial groups, higher GDP growth, less expansion of poverty and the greater production of high-paying mid-skilled jobs. In these aspects, opportunity cities like Houston greatly out-performed their often more celebrated rivals. But for this model to continue to succeed, Houston must confront many challenges, some of which are a direct product of its successful growth. Opportunity urbanism is not a libertarian fantasy; government must and should play an important, even expanding role. There remains, as we spell out in our report, enormous need to expand the region's infrastructure, and, most important, to improve the educational institutions of the region, from the troubled grade schools to expanding vocational programs and building up the area's still inadequate higher education. The one statistic that best encompasses the success of the Houston opportunity model and exposes the weakness of smart growth is the cost-of-living adjusted average paycheck (see chart). Despite the assertions of New York Times columnist Paul Krugman, among others, that the Texas urban economy is based on low wages, Harris County's average household income is above the national average; close to that of Boston. But once the cost of living is factored in, Houston does far better for its citizens compared to any of the legacy cities. 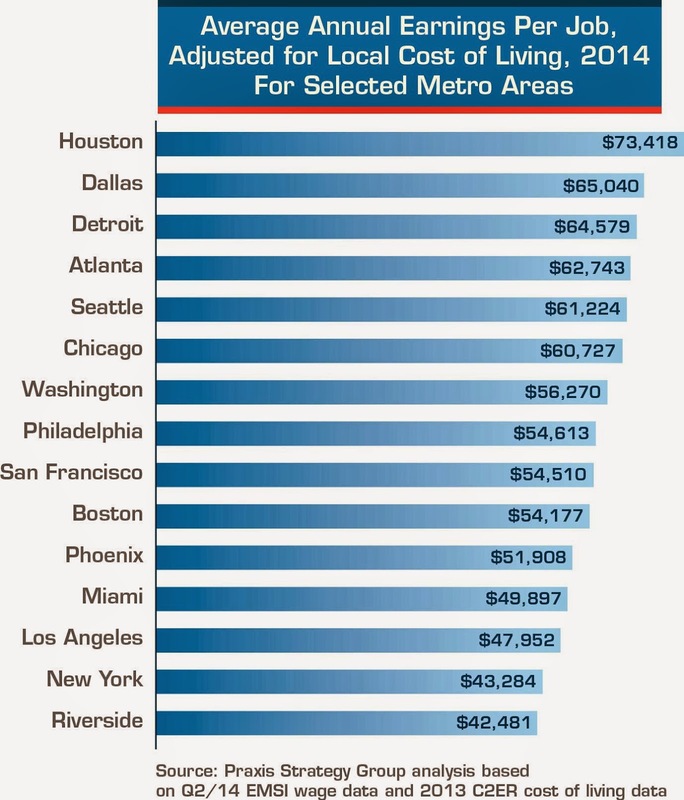 Houston, with Dallas-Fort Worth a strong second, is able to provide its citizens the highest standard of living, as measured by average annual adjusted wages, of any major metro area in America. This is different from subjective "quality of life," but includes such basics as jobs, housing and overall cost of living. In the end, the key advantage and promise of opportunity urbanism lies in finding ways to help residents fulfill the basic aspirations of citizens. Far more than glittery events or celebrity culture, what really matters is whether a city helps improve the often mundane conditions of life. "Everyday life," observed the great French historian Fernand Braudel, "consists of the little things one hardly notices in time and space." This approach follows Aristotle's notion of the ultimate purpose of cities - about serving as an engine for improving lives. It is a great thing that America continues to boast some of the most luxurious, edgy and attractive urban districts in the world. But we also need cities that can nurture new and innovative businesses, while accommodating families, middle- and working-class people with a high standard of living. Opportunity urbanism, and cities like Houston, provides that option. Kotkin is an author, executive editor of NewGeography.com and Roger Hobbs Distinguished Fellow in Urban Studies at Chapman University. Gattis writes the Houston Strategies blog. Kotkin: "People go to Houston because they like the community, can make a good living and everyday life is better"
Business Week on Houston and how we're issuing more building permits than all of California with 6x the population. Since 2000, we're almost an even match! Houston actually has a pretty pleasant climate compared the most of the rest of the country. Hat tip to Leo. An analysis shows that Houston's transit access is actually pretty good, and that's before the big redesign that's coming. As Houston enjoys staggering growth, can a city known for its lack of zoning and car-centric ways embrace a more pedestrian-friendly urbanism? I love this awesome idea for a public mega-pool in Houston, similar to Barton Springs in Austin. Houston is the #1 metro in the country for per capita GDP growth from 2010 to 2013, and our GDP per capita is actually much higher than NYC, Chicago, Dallas, or LA. There are plenty more where those came from, but that's enough for this week. "Over the past decade, a new paradigm of determining "what makes a great city" has emerged. This new way of thinking, known as "Opportunity Urbanism," is best exemplified in the greater Houston region. By embracing Opportunity Urbanism, both the city and the suburbs are flourishing. Across a broad spectrum – income growth, new jobs, housing, population growth and migration – no other major metropolitan region in the nation has performed as well as Houston over the past decade. Join us on Oct. 9 as Joel Kotkin, one of America's foremost urban theorists, share his latest research findings which suggests that opportunity cities like Houston offer far better prospects for the vast majority of their citizens." If you'd like to attend - and we'd love to have you - registration details are here. First, Joel Kotkin on our local NPR "Houston Matters" show "What Makes Houston the Most Ideal “Opportunity City?” He very generously gives me a shout out right at the beginning near the 0:50 sec mark (it's only 7 minutes). The energy and tech capitals of the U.S., Houston and San Francisco have little in common, but in the coming decades they are likely to become America’s dominant cities. "Today we are seeing yet another shuffling of the deck among American regions. New York remains the country’s preeminent city, but its most powerful rivals are likely to be neither Chicago nor Los Angeles, but rather two regions rarely listed in the hierarchy of influential regions: the San Francisco Bay Area and Houston. Far less appreciated, Houston, rather than being a southern city of duller wits, actually ranks second in engineers per capita. If the Bay Area is master of the digital economy, Houston ranks as the technological leader of the material one; it is the capital for the energy-driven revival of U.S. industry, not only in Texas but throughout the old industrial heartland. Revealingly, Houston actually has seen far more rapid growth in both college educated and millennial population since 2000 than the Bay Area, as well as New York, Chicago, and Los Angeles. Ironically, Houston’s growth has been more egalitarian than that of the notionally super-progressive San Francisco region. A recent Brookings report found that income inequality has increased most rapidly in what is probably the most left-leaning big city in America, where the wages of the poorest 20 percent of all households have actually declined amid the dot com billions. Perhaps the biggest differences can be seen in families. Of the nation’s 52 largest metropolitan areas, the Bay Area has the lowest percentage, 11.5 percent, of people ages 5 to 14. In Houston, 23 percent of the population fits this age category. In particular San Francisco is notoriously inhospitable to families, with the lowest percentage of kids of any major city. The two regions also reflect very different urban forms. The Bay Area’s leadership has opted to favor dense “in fill” growth and sought to restrict suburban development. Houston has taken a different tack. As its population has expanded, so too has the metropolitan area. This includes the development of many planned communities that appeal to middle class families and many immigrants. In 2013, Houston alone had more housing starts than the entire state of California. But it would be wrong to dismiss Houston’s model as merely “sprawl.” Instead it is better seen as simply expansive. In fact, arguably no inner ring in the country has seen more rapid growth, with high-rise, mid-rise and townhouse development in many long neglected districts. The increase in high-density housing tracts (more than 5,000 per square mile) since 2000 has been almost ten times higher than the Bay Area. The Valley’s hostility to fossil fuel energy, and its jihad to destroy an entire industry, is only barely recognized in Houston. I also have never heard anyone there suggest that Silicon Valley should be closed down as a danger to the planet (or at least a threat to the attention span of younger Americans). Houstonians, particularly in the energy industry, generally lack media savvy, which is one reason why energy is widely rated as the country’s least popular industry. Also missing, thankfully, is the sense of entitlement and self-congratulation one finds in the Bay Area. But once the intention to devastate the oil and gas industry is better understood, expect the energy capital to square off against the tech center, generating what may be the regional battle royal of our era." There's a great discussion of the article going on over at HAIF, and of course I'd love to hear your thoughts in the comments here. Big congrats to Mayor Parker for being nominated for this prestigious international best mayor prize. Houston scores impressively well on these metro GDP rankings, especially in recent growth, both as a whole and per capita. "The metro areas that form the twin pillars of America's knowledge-energy economy continue to rise and prosper, according to new figures on economic growth released this week from the Bureau of Economic Analysis. According to the data, which measured economic output as gross domestic product (GDP), the energy hub of greater Houston showed the fastest growth in terms of economic output last year, while the Silicon Valley tech hub of greater San Jose came in second. Also troubling, the nation’s three largest metro economies all registered below average growth: New York saw a growth rate of 1.0 percent (220th of all metros); L.A had a growth rate of 1.2 percent (204th); and Chicago clocked in at 1.3 percent (201st)." Aaron Renn on the "new donut" in cities with a healthy inner core and outer ring, but a very weak middle ring. Houston most definitely has a very big issue with this. "Thirty years ago, the idea of hiring a firm from a smaller city for such a big project would have been akin to wearing a dress made by a seamstress in Lubbock to the opening of the opera. It might work, but then again it might not, and the potential for humiliation wasn’t worth the risk. Now, the fear of humiliation is gone: The award-winning Lake/Flato was simply the firm that best understood the local culture and had the right aesthetic. It is this self-confidence that probably surprises visitors most. No one in Houston thought it was particularly remarkable that in 2010 it elected the first lesbian mayor in the country: Annise Parker had been in public office for more than a decade. What may be best about Houston, though, is what hasn’t changed over the years. Its passion and respect for eccentricity remains: An inner-city cottage covered entirely in beer cans is now protected by a nonprofit foundation, and there is even a move afoot to save the Astrodome from the wrecking ball, despite the fact that the world’s first domed stadium long ago outlived its usefulness." Surprise - a national study finds time the most important factor in using transit, which is a big factor in the popularity of our Park and Ride express buses. Point-to-point at 60+mph with job center circulation always beats a train netting out to 20-30mph plus a transfer or long walk. "Dallas-Fort Worth is the best performing U.S. city between 5 million and 10 million population, at 26 minutes. Travel time in Houston, Miami and Philadelphia is almost as short, at 27 minutes. Only the Germany’s Ruhr Valley (Essen-Duisburg-Dortmund) does better than these cities, at 24 minutes. Hong Kong’s travel time is the longest in this population category, at 46 minutes. This may be surprising, since in many ways Hong Kong conforms to current urban planning ideals. It is the densest urban area in the high income world and the largest transit work trip market share. Despite the hostility of planners toward the automobile, the secret lies in automobile access. Generally, automobiles are faster than other modes, such as transit, walking and cycling for trips of the lengths required in modern metropolitan areas. The U.S. also has more dispersed (decentralized) employment, which increases access and shortens travel times. Only 8 percent of major metropolitan area employment is in the downtown areas (central business districts) in U.S. cities."